The premise is simple: drag a photo to a special collection in Lightroom, and voila, it's sent to PicasaWeb. From then on, changes that you make to the photo in Lightroom are automatically kept up to date in the copy at PicasaWeb. First of all, Publish is an extra feature in addition to the “normal” export offered by Lightroom via this plugin (and earlier versions of this plugin all the way back to Lightroom 1). 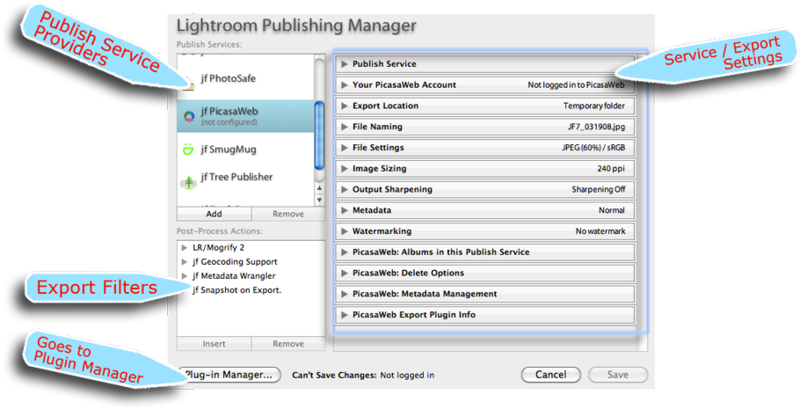 Publish allows you to set up an ongoing relationship between specific images in your Lightroom catalog and their appearance at PicasaWeb. This kind of ongoing relationship makes a lot of sense for some situations, while the normal export we've had since Lr1 makes more sense in others. Before you can use Publish to send images to PicasaWeb, you must first configure the particulars about how the exports are to be done, such as deciding on the size and quality of the exported images, and the details about which account at PicasaWeb they should be sent to. 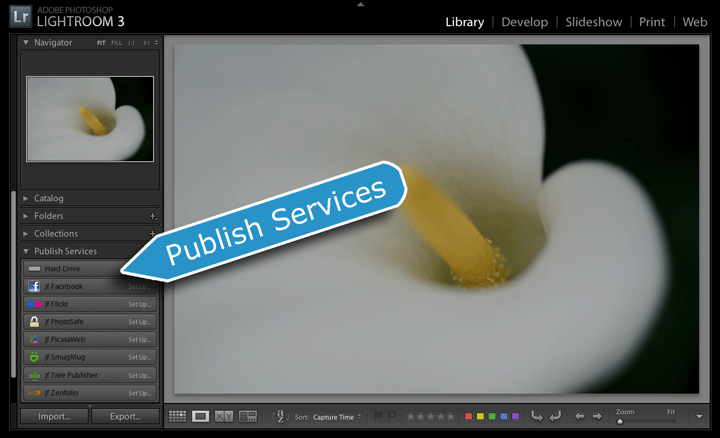 This configuration, which you generally do only once, creates a Publish Service in your Lightroom catalog. You can have multiple PicasaWeb publish services (all provided by the one plugin), but it makes sense for most people to have only one. However, if you have multiple accounts at PicasaWeb that you'd like to send images to with Publish, you'll need to configure multiple PicasaWeb publish services. After you've configured a publish service in your Lightroom catalog, it is represented in your Lightroom library as one or more publish collections, each holding the group of photos that are to be sent to a particular album in your PicasaWeb account. Just drag a new photo to it, press the “Publish” button, and the photo is rendered and uploaded to the associated album at PicasaWeb. New Photos to Publish — photos that have been added to the publish collection, but have not yet actually been sent to PicasaWeb. They'll be sent to PicasaWeb the next time you launch Publish (via the “Publish” button). Published Photos — photos that have been sent to PicasaWeb and have not been modified in your Lightroom catalog since. Modified Photos to Re-Publish — photos that have been sent to PicasaWeb, but which have been modified in Lightroom since. They will be re-sent to PicasaWeb the next time you launch a Publish action. When you actually launch a Publish action, Lightroom fires up an export under the hood, and photos are rendered as per the various settings configured when the publish service was created (the details of which follow in the next section of this document). As each photo is uploaded to PicasaWeb, it's moved to the “Published Photos” section. You can click on each segmented-grid section's header to expand and collapse it; if they're all collapsed you can watch their photo counts, shown at the right side of each segmented-grid header, update in real time. Before creating a Publish Service to reflect an ongoing relationship we'd like to have between this Lightroom catalog and PicasaWeb, it's probably a good idea to make sure that any information about photos at PicasaWeb already in the catalog is correct, and that it has all the information about all the photos at PicasaWeb that it should. Of course, if you're new to PicasaWeb, you don't need to worry about this section at all. 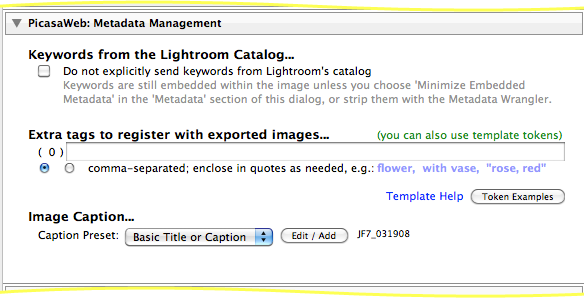 Refresh — Refresh the per-photo PicasaWeb data already in the Lightroom catalog. Associate — Add per-photo PicasaWeb data for images in your catalog that are already at PicasaWeb that the catalog doesn't know about. Populate — Pre-populate Publish Collections with appropriate photos on a per-album basis, so that Publish reflects the current status at PicasaWeb. Steps #1 and #2 are accomplished via the File > Plugin Extras > PicasaWeb Extras dialog, which is shown at right. The two items we're concerned with for the moment are highlighted by the red outline. The maintenance items in this dialog work with the PicasaWeb account that the plugin has most recently worked with. If you work with multiple PicasaWeb accounts in Lightroom (or have not worked with any yet), you'll want to first visit the normal Export Dialog or a Publish Service's Edit Settings dialog to make sure you're authenticated to the PicasaWeb account you want to work with here. The account name is shown in the upper-left of the dialog, under the logo graphic. The “Refresh All Remote Urls” item in the dialog looks at every photo in the catalog that already has PicasaWeb-related data, and confirms with PicasaWeb that the data is up to date, correcting it if it's not. This "correcting" includes marking a Published photo to be republished if its copy at PicasaWeb is found to have been deleted. If you've got a lot of PicasaWeb/Lightroom history it might be a good idea to do this once, but otherwise, you probably need to do it only after making sweeping changes at PicasaWeb “out from under” Lightroom, such as doing mass deletions of photos at PicasaWeb, changing album names, etc. Because this involves contacting PicasaWeb for every photo, be prepared that this step can take a long time if you have a lot of photos. But it's important to do at least once if you have PicasaWeb history in this catalog, because the next step, “Associate Images” needs the currently-correct URL of each photo at PicasaWeb to work. Step #2 involves checking every photo at PicasaWeb against every photo in your catalog, finding and remembering pairings that Lightroom didn't already know about. This also generally needs to be done only once, and only if there are photos at PicasaWeb that you uploaded outside of Lightroom. There is some risk in this step, due to the ramifications that could ensue from mistakenly pairing up the wrong Lightroom/PicasaWeb photos. When Lightroom thinks that a particular catalog photo is already represented at PicasaWeb, subsequent exports of the photo to PicasaWeb could result in replacing the copy (it thinks is) already there. All exports via Publish are “replace” exports, as are normal exports with the “replace” option turned on. The danger, therefore, is in replacing the wrong photo, thereby unintentionally deleting the unlucky unrelated photo at PicasaWeb, and associating the new image with any comment history the unrelated image had accumulated. If there are multiple photos taken at the same time at PicasaWeb, or in Lightroom, none of them are paired up. Times are compared down to the second, but not sub-second, which means that shots taken during a high-speed burst can not be paired up. Photo filenames (without the filename extension) are compared, and if there's an exact one-to-one correspondence, they are paired up. If you change the name of the file during export to PicasaWeb, it makes no sense to attempt filename pairing, nor does it if most of your filenames are not unique. This step can take a very long time. One test I did with 10,000 images in Lightroom and 5,000 at PicasaWeb took about three hours. At least it can now complete — plugin versions prior to July 2010 hit a Lightroom bug that often caused the process to essentially lock up, but with some pointers from Adobe, I think I've worked around that now. Let's look in detail at configuring a publish service to export to your PicasaWeb account. Make sure that the PicasaWeb plugin is installed and enabled, then click on the “Set Up...” of the PicasaWeb header in Library's list of publish services. Items show up in the list of Publish Services (highlighted in the upper left) when their plugin is installed and enabled in the Plugin Manager. Old Lr1 or Lr2 plugins won't provide this new feature, of course, but most of my “export to...” plugins, including PicasaWeb, do. If you have only one PicasaWeb account, you probably want to leave it at its default of “jf PicasaWeb”. It looks ugly in this dialog, but when left at its default it won't even be shown in the list of publish service in Library, as seen in the screenshots above. If you set your own name, such as “My PicasaWeb Stuff”, it shows up in the Library list as “jf PicasaWeb: My PicasaWeb Stuff”. So if you need just one PicasaWeb publish service, it's cleanest all around to just leave the name at its default. You can always change it later. However, if you have multiple accounts, you'll want to name them, e.g. “PicasaWeb Work” for one and “PicasaWeb Play” for another. Most people leave the export-location setting at the default of “Temporary folder”, but you might set it to some specific named folder if you want to keep a local copy of all the images that have been published to PicasaWeb. Again, Lightroom does not allow this setting to be changed once the publish service has been created. These settings, such as the image size and quality, can be changed later, but doing so means that you have to re-publish (re-render and re-upload) everything you'd already sent to PicasaWeb, at least if you want the setting changes to be reflected in the images already at PicasaWeb. More on this later, but it's best to pick the settings you want up front, so you don't have to change them later. Each section can be opened to reveal the filter's particular settings, of course, but the filter details are not relevant to this overview about Publish, except to note that like the standard Lightroom settings (image size, etc. ), changing these filter settings after a publish service has been established means that you have to republish everything if you want the changes to be reflected in images previously published to PicasaWeb. For each album at PicasaWeb, you can choose a normal collection, a smart collection, both, or neither. The publish-collection version of a PicasaWeb album starts out empty, which is perfectly fine if the album at PicasaWeb is actually empty, or if you don't mind that the publish-service manifestation of the PicasaWeb album shows only images you add from here on in. However, if you'd like the current collection of images in the PicasaWeb album to be reflected in the newly-created publish collection, it's a three-step process. The first two steps, discussed above in “First Things First: Knowing Your Current Vantage Point”, need be done only once per Lightroom catalog, but this third step should be done each time you create a new Publish Collection, at least if you want it to be populated to reflect images already at PicasaWeb. option (or clicking on the “repopulate now” links that appear when editing Publish settings), the plugin fetches the list of images for each album from PicasaWeb, finds the associated image in your Lightroom library (via the knowledge gleaned from steps #1 and #2), and adds it to the publish collection for you. As a bonus, it puts it into the "Published Photos" section, to reflect that it doesn't need an initial render and upload. 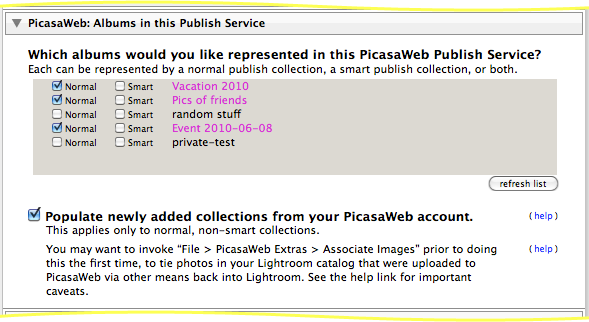 Unfortunately, limitations in Lightroom 3's publish architecture prohibit step 2 from being applied to smart publish collections, so photos that get computed into a smart publish collection must be rendered and uploaded to PicasaWeb, even if they already exist at PicasaWeb. If the smart collection has many initial images, this could require substantial time when you first publish it. If you ask the plugin to create a smart publish collection, it does so with a dummy rule that matches no photos. Once it's been created and the publish-service dialog is dismissed, choose "Edit Smart Album" from the collection name context menu to replace the dummy rule with whatever rule or rules you want. You can remove a publish collection from your publish service via the “Delete” item in the publish-connection name's context menu. Doing so does not remove the album or its photos from PicasaWeb: for such a major operation, please visit PicasaWeb directly. If you delete a photo from PicasaWeb, you can always upload it again, but all its “value add” at PicasaWeb will have been lost forever — comments, ratings, history, etc. — will be disassociated from the photo and lost. On the other hand, if you don't delete it at PicasaWeb, it's still there, which is perhaps not what you want if you're deleting it from a PicasaWeb-related publish collection. I strongly recommend that you leave this option at “Ask” until you're so comfortable with the idea that photos at PicasaWeb will be deleted when you delete from a PicasaWeb-related publish collection that you become annoyed at the “Ask” dialog. Actually, to be clear, when a photo is removed from a PicasaWeb-related publish collection, it goes into the collection's “Deleted Photos to Remove” section, as mentioned above. It's only when you then initiate the Publish action on the collection that this option comes into effect, and that photo copies at PicasaWeb are deleted (if you've so instructed). The second option covers the case where a photo that happens to be published via this service is deleted altogether from Lightroom. 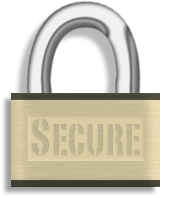 If you want to protect photos that have been published at PicasaWeb, choose “Disallow”. The next section configures various PicasaWeb-related metadata options, just as in a “normal” PicasaWeb export. You can edit the publish-service settings via the “Edit Settings...” item in the publish-service name's context menu. You can change all settings except the account at PicasaWeb and the export location, but there's a catch: if the change relates to something about how each image is exported and uploaded (such as the size or image quality, metadata settings, etc.) and you want those changes to be reflected in photos already at PicasaWeb, it won't happen magically: you'll have to republish them all. When I try to associated images from my picasa web account it seems to miss a lot. I havent renamed anything, why would it do that? some photos are associated and populate collections in lightroom. but many are missing..
Jeff, thanks for the plugin! It would be great if we could make a “publish” just an attribute to an existing collection. That way one can maintain consistency between the collections names and the published collection names in your plugin. The picasaweb album would be created with the same name as the collection name. The current manual approach via “Edit Settings” works, but it’s a hassle. Am I misunderstanding how things are designed to work ? First off, thanks for the great LR plugins! I’m using the Flickr, Metadata and Picassa versions and am very happy with all of them. One question though as it relates to Picassa. I have a “smart” publishing setup to go to one particular album, which works perfectly, but a copy of the image is also put in the “Photos From Posts” album. I’d prefer for this to not happen. What did I miss in the plugin setup that’s causing this? Like this plugin very much! Can you also use it to publish to a Google+ Page? Did not find anything pointing in that direction yet. I have reached the limit of my free Picasa webalbums account, but since I have a Google+ account I should be able to continue to load images smaller than 2048 pixels as longest dimension. But, when I specify in the settings to resize the longest edge to 2000 pixels, I still receive an error stating that I have exceeded my data-storage quota. I am using your Plugin and Picasa – works great. One question: Is there a way to export captions (in my German language Picasaweb, it’s called “Bildunterschriften”) from Lightroom, e.g. from the Title or Caption metadata so they are visible with the picture? Do you know what I have to do? Appreciate your efforts Jeffrey, I am a heavy user. Recently a problem developed. I deleted albums at Picasaweb (using Picasa), but these remain visible in Lightroom. I can find no way to re-synchronize. 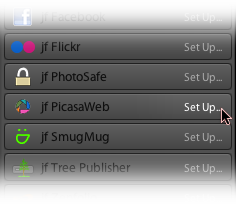 Also the list in the jfPicasa settings panel under “Albums in this publish service” behaves strange, it shows exactly the albums that are still there on Picasaweb, so did not show items from the list in Lightroom. The tick boxes in the panel show ticks next to “normal collection” but the ticks are greyed out and I cannot modify them. The tick boxes next to “smart” are still there. I have deleted the “ghost” albums in Lightroom, but this does not change the situation. Publishing a new album works fine still.. I upgraded to LR4 from 3. I am tyring to add photos from a Picasa Web album that I uploaded using another tool, into Lightroom’s Picasa Web publish, so that I can see what is already there. I tried repopulating, associating links refresh etc. to no avail. How do I get photos already in an album in Picasa to appear in Lightroom’s Picasa plugin? I’ve run into the cookie issue when trying to publish a collection to picasa. In your FAQ you mention deleting the collections and then using a “Claim” feature. Where is this feature? Can you explain this procedure in more detail? Thanks. I have been going through my collections and comparing them to my Picasa albums and finding in some cases that they aren’t matching up, mostly due to the Picasa albums being set up outside of LR. So I’ve gone through the manual match process to link the two. 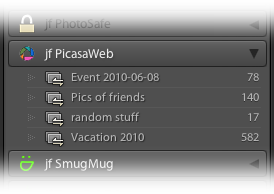 However, what I’ve found is that some photos will still not appear in the jf PicasaWeb collection. I’ve tried to clear the metadata for those photos and re-copy the URL’s and re-populate but they still won’t show up. I’m using LR5 and the latest plug-in. Yes, as I mentioned in my original post, I did go through the populate step. However, these photos still do not show up. In one case, 47 of 49 of a Picasa album properly are reflected in a PicasaWeb collection after going through the manual match process but the other two will not, even through the URL’s have been set and reset and populated and repopulated multiple times. In another collection only 29 photos of 43 will show up. I’m looking for a way to publish albums directly to one of my google + pages that I manage without having them appear on my personal page. Is this possible? Really like your picasaweb plugin. Use it on my desktop computer with no problems. However, I’m installing LR5 and picasaweb20131106.251 on a new Lenovo 11s Windows 8.1 laptop and having some problems setting up my account. When I click the authenticate to picasaweb button, no link ever opens in my browser. I also do not have the username and password entry like your screenshot shows. Can you help me out? Thanks! Still having issues with the authenticating to picasaweb, and no link appearing. Tried reinstalling LR, now using the 20140204 version. Maybe a Windows 8 or permissions issue? Should I send a log? Got the authentication working. Needed to have the ‘default’ browser open already, rather than just any browser. First of all, as everyone else has said… thanks for a great plugin. I’m likely missing something very obvious, but I can’t figure out how to add a photo to a published collection after the first selection. I’ve been successful with selecting the photos I want and creating a new publish collection the first time … but after that I can’t figure out how to drag or add additional photos to that same collection for publication. Thanks for the great plugin. Althugh I have a question on creating a smart collection. I am not able to create a new smart collection under the publish service, There is a message about a bug in Lightroom prevents from creating smart collection from context menu, however, this is working fine for the out-of-box flickr plugin. Any workaround to create a smart collection? 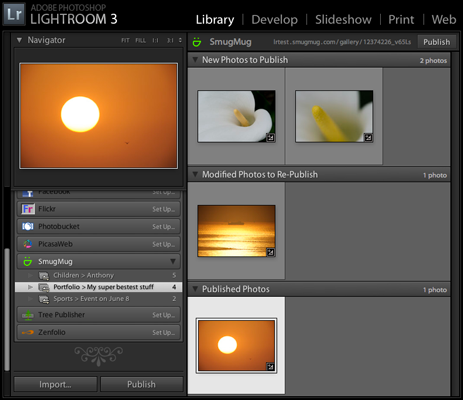 This is critical for my work flow, as I always create smart collection from lightroom first, then publish to picasaweb. Thanks for a great lightroom plugin! A couple of questions..
2) How do I update images with watermark for associated images. (I was thinking of using this to identify unmatched images). 3) Any progress on adding Albums directly from lightroom? I have been manually uploading to PicasaWeb for a couple of years. I recently started using Lightroom and used jfPicasaWeb export a few times, but mostly I continued to upload manually (outside of Lightroom). Today I decided to commit to the jfPicasaWeb publish service for ongoing uploading to Google+. I followed all the directions above, making sure to Refresh and Associate before configuring the jfPicasaWeb publish service. I checked off eight albums. When I clicked SAVE, the publish-collections were populated. I was surprised that none of the collection counts matched the number of photos in the corresponding PicasaWeb albums. It was always a lower number (in two cases, zero). I understand that automatic association has limitations, so I’m guessing that I need to go back to Extras and do the association manually. Is that what you recommend, or could it be another problem? installed the new version of JF LR to picasaweb and cannot authenticate with my picasaweb account. I see this was asked before, but not answered: I have a few miss-associations (basically filename association fails with wrap-around dsc_xxxx counters). Is there a way to dissociate a single picture, so that I can retry with time only? Thanks! Firstly, You are my hero. These plugins are amazing. You should be sainted. Secondly, is there a way to configure this to upload to my Business Google+ page? You did an awesome job with the Facebook business page plugin, but I don’t see this option in the Picasaweb plugin. Perhaps I missed something, but this would be a widely used feature. Hi. I’m in Richardson, Texas (across the street from Dallas). I installed Publish for Picasa last night and have been very pleased. Thank you! Hi, Jeffrey. Can you please add a tif file extension option for upload, as google photo seems to support it. Jeffrey, I have just installed and started using your plugin for LR Classic CC to PicasaWebAlbums/Google Photos. I am wondering if you have developed anything similar for uploading to Ipernity, or perhaps have something in hte pipeline?